The three countries that make up the Fertile Crescent, Lebanon, Syria and Jordan, share many culinary traditions and are justifiably famous for their exquisite and complex cuisines. An evocative introduction looks at the impact of history, geography, climate, religion and festivities on the food and how these influences have created such varied dishes across the region. 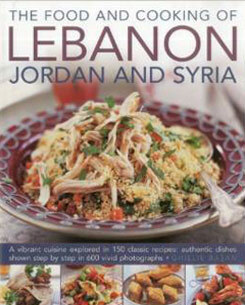 This beautiful book then presents a mouth-watering selection of classic regional recipes. Try classic mezze dishes and richly roasted meats and baked fish, as well as spiced couscous and rice dishes. There are also less known, but equally delicious recipes such as Armenian Jewelled Bulgur, White Bean Puree with Feta and Olives, Grilled Fish with dates, and Braised Rabbit with Aubergines. With more than 600 photographs, this book captures the essence of Lebanese, Syrian and Jordanese cooking, and offers you the chance to explore a rich and varied cuisine.